Kohler, the Moroccan delegation, and the Polisario delegation will speak to press following the roundtable’s second working session. 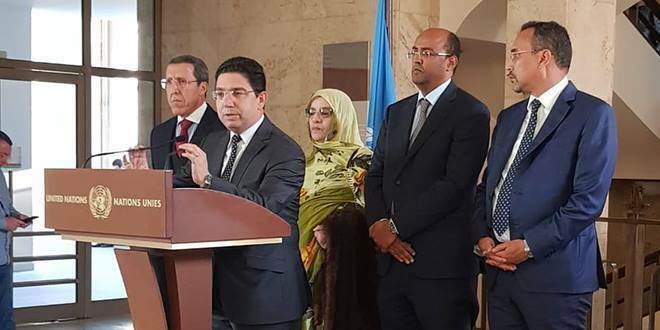 Rabat – The Deputy Spokesman of the UN Secretary-General Farhan Haq read out a brief statement to the press on Thursday, March 21, about the UN’s second roundtable on Western Sahara without giving specific details on the closed-door discussions. Haq said that all the delegations participated in the meeting on Western Sahara hosted by the Secretary-General’s Personal Envoy for Western Sahara Horst Kohler. The statement concluded that Kohler and the delegations of Morocco and the Polisario Front will speak to the press at the Palais des Nations in Geneva on Friday afternoon. Kohler’s statement will be webcast, Haq added. None of the parties involved in the conflict provide official statements on the first working session of the meeting, which kicked off Thursday in Le Rosey Chateau near Geneva. Morocco’s Minister of Foreign Affairs Nasser Bourita is leading a delegation of four members: Permanent Representative to the UN Omar Hilale; the president of the Laayoune-Sakia El Hamra region, Sidi Hamdi Ould Errachid; the president of the Dakhla-Oued Eddahab region, Ynja Khattat; and a member of the Smara municipal council, Fatima Adli. The Moroccan delegation strategically includes elected representatives from Morocco’s southern provinces, highlighting their status as spokespeople for the Sahrawi population.